Microbreweries are on the rise in DuPage County and we are proud to showcase our member breweries Alter Brewing Co., Church Street Brewing, More Brewing Co. Red Arrow Tap Room, and Two Brothers highlighting the best craft beer and food pairings for this holiday season, with our Goodwill Ambassador Judy Hsu of ABC7! Watch the 11am segment below and share with friends and family on social media! 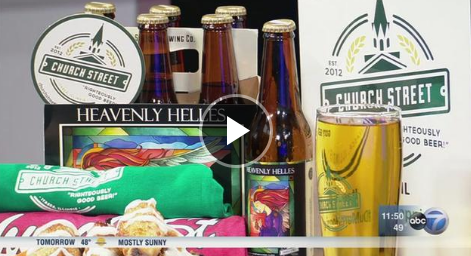 Microbreweries, or craft breweries, are trending in destinations across the nation and DuPage County is among them. There are more breweries in the US now than there were at any other time, and new locations are continuing to pop up around Chicagoland. DuPage’s diverse and affluent community, green spaces, and sustainability efforts provide an ideal setting for craft breweries. What’s the story? In 2013, three men came together and began laying foundations for a new brewery. Alter Brewing was born on December 18, 2015- built upon a passionate love for the beer industry and its people. Alter Brewing Company’s beer is a clarion call to the community to alter their preconceptions not only of what beer is, but also what beer can be. Click here for more information on their story. What’s the story? Joe and Lisa Gregor began brewing when their eldest son, Steven, came home one Christmas holiday and shared that he had been “home-brewing” with his chemistry professors. He brought home a recipe for the family to brew, and Joe quickly bought a home-brewing kit to begin the process. After they completed their first “home-brew,” Joe was hooked. Joe and Lisa began looking for a brewery location in 2010 and originally decided on a location in Addison on Church Street in 2011- hence where the name comes from. Unfortunately, the location fell through- but the name stuck. In 2012, they had finally found a new location in Itasca (their current location) and began and completed a six-month build out. This year, Church Street celebrated their five-year anniversary with a weekend full of live music, food trucks, and of course, great beer. The brewery was also awarded Daily Herald Reader’s Choice Top Pick 2017. Book the taproom for your next event or simply stop by for a free tour. What’s the story? It began with two brothers who saw the culture of craft beer as retailers, but were missing out on the action from a production standpoint. They own two bottle shops in Villa Park and have a pretty extensive craft beer selection, but wanted to open a brewery of their own to dive deeper into the community. With little brewing experience, they set out to find a brewer that they could work with along with finding a location. “We chose Villa Park because we already had invested in two other businesses in the same village and feel like we can offer even more – no pun intended,” said Sunny Patel, owner of More Brewing Company. The name comes from the town’s old name of Ardmore (which is also the name of their two bottle shops – Ardmore Station). They decided to drop the “Ard” and stuck with More. What’s the story? Brewmaster Paul Kreiner annually vacationed with family in Marquette, Wisconsin with tradition built around the town whistle. The whistle sounding at noon indicated the time to crack open the first beer. Not only is the tradition about beer, but also, camaraderie, good company of family and friends and the creation of memories. What’s the story? Joseph Tota and Jim Pacente came up with the idea of Red Arrow Tap Room during one of their frequent runs along the Red Arrow Highway in Union Pier, Michigan. They imagined a place filled with friendly people enjoying great beer and delicious food in a fun, modern environment, free of the hassles and headaches that so often accompany the contemporary restaurant experience. They brought innovation to the craft beer industry with technology, Pour Your Own self-service, and hospitality-included pricing. Red Arrow Tap Room was the first Pour Your Own establishment in the Chicagoland area and was voted Daily Herald’s Best New Restaurant in 2017. Red Arrow Tap Room features 48 self-serve taps featuring independent craft beer, wine, and cocktails. At Red Arrow, individuals get to pour as much or as little as they want, and are charged by the ounce. Customers of age receive a Pour Pass that is either linked to their credit card or prepaid. Patrons insert their Pour Pass into the tap of their choice, their funds are displayed on a monitor and then they’re able to pour their own beverage. What’s the story? Two Brothers Brewing Company was founded by brothers Jim and Jason Ebel who discovered their passion for beer while traveling the world. Over the past 20 years, Two Brothers has grown and spread into over a dozen states, but always remains true to its passion. The company plans to remain family owned and not sell out to a big corporation. Two Brothers continually finds ways to use technology to improve efficiency and conserve energy. Click here to learn more about their story and their green initiatives. Share your brewery experiences with us using #DuMoreHopping. And, if beer isn’t your thing, check out our local wineries- Lynfred Winery and D.O.C. Wine Bar. This story of beer just made me want to drink one. And did you know that you also have a great craft beer podcast that is published from West Chicago? The Brit and Yankee Craft Beer Podcast has been covering craft beer and breweries across DuPage and Chicagoland since 2007. One brewery you have missed is Dry City in Wheaton! Plus Emmets is in Wheaton as well! And to add a further comment, Hopvine Brewing in Fox Valley Mall has brewed a celebratory beer for the Royal Wedding of Prince Harry and Meghan Markle, in collaboration with The Brit and Yankee Craft Beer Podcast. It will be available on Saturday at the brewery. Its called Markle Sparkle and its a British Strong Golden Ale. Stop by and sample it…DuPage is rocking with greT breweries!